You missed one. After spending the summer hopping between the islands in the Mediterranean Sea—lucky you—it’s almost time to return home. But you forgot the Aegadian Islands. If you hurry, you can reach Marettimo before it’s boarded up at the end of the season. The Aegadian Islands sound Greek. They look Greek, too. But the Islands of Goats actually lie off the northwest coast of Sicily. 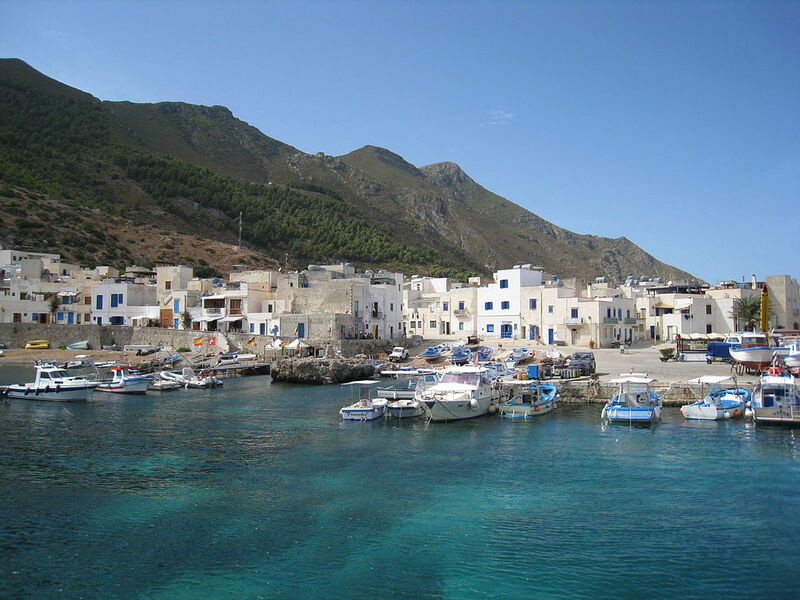 There are five islands: Favignana, Levanzo, Marettimo, and two minor ones. You quickly set your sights on Marettimo, since it’s the westernmost island in the group. Marettimo was named Hiera (Sacred Island) by the Greeks and became an important Roman observation point for maritime traffic. The limestone island has steep cliffs that drop into the sparkling blue sea. Hidden coves and grottos dot the coast. Pine trees fill much of the interior. Pink cistuses, prickly pears, and sweet-smelling thyme grow among them. Eagles and peregrine falcons live here, too. While hiking trails, not roads, connect the ruins of Casa Romana, a restored Byzantine-Norman church, Punta Troia, and Monte Falcone. There’s a single village on the island. It too is named Marettimo. As you pull into the harbor on the hydrofoil from Trapani, you see whitewashed buildings with blue shutters, small fishing boats, and a couple of fishermen fixing their tuna nets on the dock. Gulls screech overhead in hopes of finding leftovers from an earlier catch. Your first stop is La Scaletta for your morning cappuccino. You vow to return when you see the cannolis and the cassatas (sponge cakes with creamy ricotta) behind the bar. You’ve been told not to miss the lobster soup at Il Veliero either. So you’ll hike around the small island. You’ll swim in a little cove and sun yourself on the rocks above it (the single beach is pebbly and filled with Speedos). Then you’ll stuff yourself with fresh pasta, just-caught seafood, and sweet treats. Unfortunately, since there aren’t any hotels on Marettimo, you have to catch the last ferry at the end of the day. Something had to force to you to go home anyway.